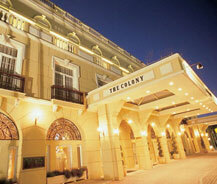 The colony hotel is one of the five star hotels around Kyrenia. This is situated between the Mountains of North Cyprus and the blue Mediterranean Sea. This hotel is well known for its elegant look and design. It also offers service at its world class style and its decoration, atmosphere itself shows that is one of the world class hotels. This colony hotel is a four storied building with its palatial faÃ§ade and the architectures innovation marked its opening last year by reconstructing an old colonial building. This building has designs and looks which are new and very attractive all these things are carried out to rooms and each and every room is also designed and built with same care. This hotel is very near to picturesque harbor so that it can be reach by walk within a few minutes and from Ercan Airport it is just 35 minutes away. In its shoreline you can view some of the world's most beautiful and elegant beaches. It has various restaurants such as premier a la carte restaurant, courtyard piazza restaurant, roof top vista terrace snack bar, and rooftop misty snack bar. In this rooftop restaurants are available only during summer. Other than this the rooms offered here has all the facilities which make the visitors more comfortable.